How fierce is the competition for technical talent in Massachusetts? Software developers right out of college can command starting salaries of up to $90,000. Once in their jobs, they can get as many as 20 recruiting calls a day trying to convince them to leave for another company. And when they do, a 20 percent to 25 percent bump in salary is not unusual. The shortage of skilled technology workers has become the No. 1 issue for many Massachusetts companies and a growing concern for the state’s innovation economy. Tech executives describe the hiring environment as brutal — worse even than the dot-com boom in the late 1990s — and a threat to their ability to expand, develop new technologies, and keep growing. 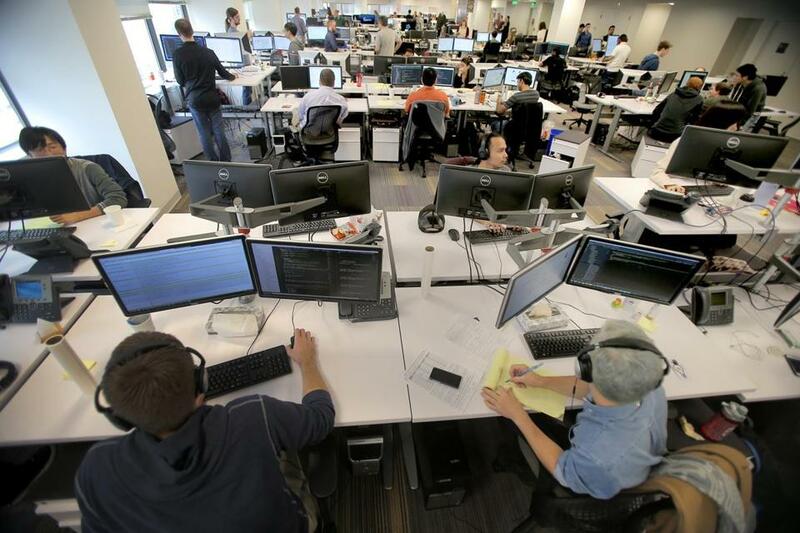 An index published by the Massachusetts High Technology Council, a trade group in Waltham, ranks Massachusetts as the most difficult state in the country to hire tech workers, along with Maryland and Virginia. The index, compiled with Worcester Polytechnic Institute, the employment site Monster.com, and the New York research firm Wanted Analytics, is based on a variety of data, including job postings and local unemployment rates. The state is facing the prospect of a wave of retirements and difficulty in finding qualified replacement workers. Read: 2015: Could Mass. lose its edge in life sciences? The shortage is worse than previous tech booms, executives say, because of the rapid growth of young companies such as the Needham travel site TripAdvisor Inc., Cambridge digital marketing firm HubSpot Inc., and Bedford robot maker iRobot Corp., which routinely have dozens of job openings. In addition, local companies are not only competing for talent with traditional rivals Silicon Valley and New York but also new technology hotbeds such as Colorado. And it’s not just tech companies fighting for talent. The publisher Houghton Mifflin Harcourt Co., for example, is expanding its digital offerings and recently moved its Incubation Lab, which develops technology products for education, to Boston from East Hartford. Claudia Reuter, the senior vice president who leads the lab, said hiring software developers for her 15-person team has been a challenge. Growing companies such as iRobot and HubSpot slug it out every day with long-established companies and recent startups to lure software developers, data scientists, and engineers of all types. Many firms offer finder fees of up to $10,000 to employees who refer successful job candidates; HubSpot in 2013 famously offered a $30,000 bounty for software engineers and designers. Russ Campanello, executive vice president of human resources at iRobot, described the talent market as the tightest he’s seen during 25 years in human resources. Average time to make a technical hire at iRobot is two to three months, and up to a year for highly specialized positions such as robotics and vision scientists. In the past 14 months, iRobot has added six technical job recruiters and made hiring a top priority at the company. Typically, iRobot pays $65,000 to $80,000 for engineers and developers right out of college, and up to $130,000 for mid- or senior-level jobs. Money is important, Campanello and other executives said, but to land top talent, tech firms must also offer professional challenges and opportunities to contribute to society by advancing technology. The shortage of technology talent is particularly acute in cybersecurity, where demand is booming as attacks grow. Cyberattacks increased by 48 percent in 2014, according to the accounting and consulting firm PwC, and are expected to increase further as devices from phones to appliances to cars become connected to the Internet. A recent study by chip maker Intel Corp. of Santa Clara, Calif., projected that the number of connected devices worldwide will reach 220 billion by 2020 — a ripe target for cybercriminals. Matt Moynahan, president of the Burlington cybersecurity firm Arbor Networks Inc., said it already takes up to 102 days to hire an experienced professional, even with annual salaries that recruiters say can top $200,000. 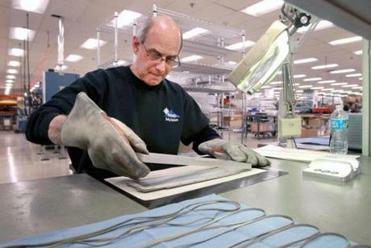 Arbor, which has 490 employees, has added 88 jobs over the past year, but Moynahan said he would hire at least 50 more — if he could find the workers. In the meantime, the war for talent is being waged in Kendall Square, Fort Point, downtown Boston, and the Seaport District, as well as the old centers of the state’s tech sector, the Route 128 and I-495 corridors. It’s a fight among startups, fast-growing young firms, and multinational corporations, such as the German software maker SAP SE and Oracle Corp. of Redwood City, Calif., which both have operations in Massachusetts. LogMeIn Inc., founded in 2003, has grown to more than 1,000 employees worldwide, with about 500 in Boston. The company writes software that manages logins and passwords and allows people to access systems and devices from remote locations. To attract and retain young workers — the average age of a LogMeIn employee is 29 — the company offers perks such as Foosball, a basketball court, and a roof deck. Still, at any given time, the company has 50 to 100 tech jobs open. This situation is particularly tough for startups, which can’t offer the same pay, benefits, and stability of larger firms. They compete for talent by offering stock, intimate work settings, and opportunities to have a greater effect on the growth and direction of the companies. The stakes are higher for startups, too. In a small staff, a single person can propel a startup with a great idea. But the wrong person, or the wrong idea, can also break it. NetBlazr, a low-cost Internet provider founded in 2010, has 14 employees. For six months, the Boston company has looked for a senior network engineer with 10 years’ experience who can mentor younger staff. At Trilio Data Inc., a Hopkinton firm that provides data backup and recovery services, chief executive David Safaii plans to double the size of his 15-person workforce — if he can find the people. The company has had openings for two software developers and a sales engineer since November. “They are very hard to come by,” Safaii said. John Dodge can be reached at jdodge349@gmail.com. Follow him on Twitter @Thedodgeretort.